Great efficiency in counter attacks allow Everton to take 3 points away from Southampton. However, better use of open space by Saints could have resulted in a different story. Basic formations in the first half. With the ball Everton played with it in-front of the Southampton midfield, circulating the ball horizontally. This was often after winning the ball from deep positions, initially looking to counter attack, before delaying the attack to keep the ball. Lukaku and Kone would rotate positions, along with the 442 graduations of the team to be a front two when the team had the ball. Kone initially started on the right, with inside movements off the ball, before moving towards the ball (back to goal, centrally) to receive the ball. He would continue his good possession play when switch to striker – similar to his performance last week. Lukaku was different when he was on the right. He would stay wide and wait to receive the ball, facing goal, before looking to either run direct at the Southampton defence with the ball, or to hold the ball and look to use an overlap of one of his teammates. As a striker, Lukaku was far more effective and efficient in counter attacks – with space to attack – than his associative play in organised possession. During counter attacks he showed his immense physical attributes to run past players with the ball, make depth movements. His finishing was also clinical during counter attacks. Low amounts of central presences from the Saints due to the roles of the front 4 offering poor or inefficient possession and connections. Long started on the left, acting as a wide forward. He wouldn’t get involved in much creation, instead making runs into the box to support Pelle and compete for the second ball. Tadic was on the right, but his inability to resist pressure was his only contribution to the game. Mane was central, where his movements were mostly in the box or behind the fullbacks. This role limited his influence in creation, which would change later on in the game. Pelle was the target man striker, who would target Stones in the Everton backline and waited for deep diagonal crosses, from the full backs, into the box. These crosses were a main theme through the game, but particularly in the first half they were the only real situations where Southampton created chances. In the second half, Southampton forced Everton back to a deeper block with more box pressure and central presence. This made things difficult for Everton to get out of their own half, with Lukaku only option forward and poor connections to receive the ball from him – due to the distances being too far apart, as well as Lukaku not being able to hold the ball for long enough until support arrived. He was able to make good use of the space behind the Southampton centre backs when the would play immediately over the top, however they played very few balls into depth for him. This, to an extent, solved the problem of controlling the central areas, during counter attacks, that Southampton had in the first half. 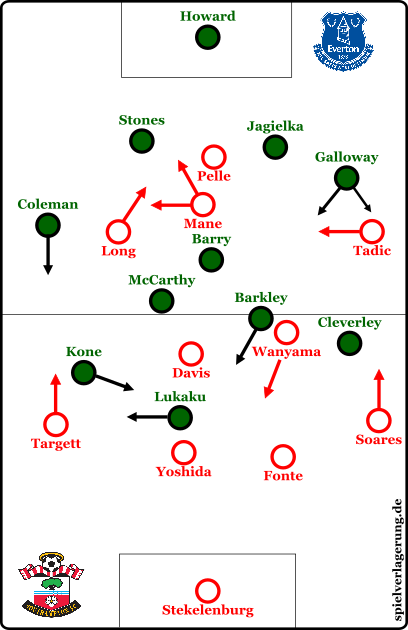 Barkley was deeper positioned and couldn’t run off Romeu – unlike Davis in the first half – and Wanyama was positioned deeper to support (unlike the first half, where he would often move higher to counterpress). There was possibilities for Southampton to use the open space in-front of the Everton back 4 (either side of Barry) in both halves. The ways of which they tried to expose this was indifferent. In the first half, they would try to use Tadic to come deep in the right halfspace and receive the ball. However, when any of the Saints offensive players would make such movement towards the ball, an Everton defender would follow them and pressure them tightly from behind. Galloway dominated these situations with Tadic static upon receiving and subsequently losing the ball. In the second half, Long was more efficient in retaining the ball in these situations (when moved to the right) but the ball would immediately go back to one of the central midfielders and the space wouldn’t be used. 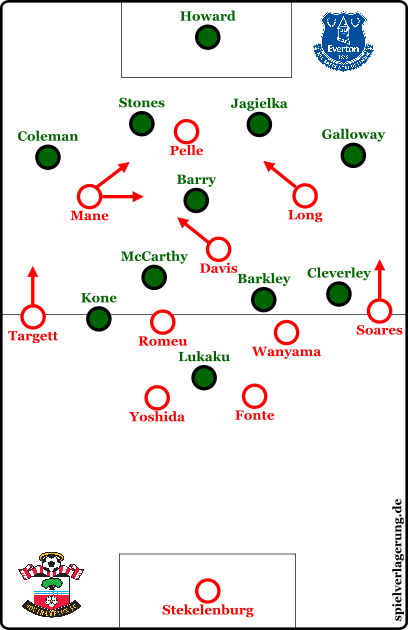 The same situations occurred on the left of the pitch in the second half, with Mane and Coleman. Mane was the most efficient of the three due to his great pressure resistance and dribbling ability to then move out of the pressure. Second half changes from Southampton. In the second half, Southampton brought Romeu on for Tadic. Davis moved to play as the attacking midfielder, Romeu came on into the double pivot, Mane was moved to the left flank, and Long moved over to the right flank. This new wide role – and flexibility to rotate wings with Long – allowed Mane the possibility of becoming more influential in the game. There were some situations where he would receive the ball on the left flank, and then dribble diagonally inside to the open halfspace (this space was especially open due to Lukaku and Kone not sufficiently covering this wing). Kone and Cleverley later swapped wings to try and prevent this, but Mane would switch wings with Long at the same time to create different situations on the right – such as one instance where Pelle moved out wide, Mane gave him the ball and run into the open channel between Gallows and Jagielka before receiving the return ball in the box. This kind of diagonal movement was also much more profitable due to the way the Everton block is setup. The back 4 will follow players and man-mark them tightly if their starting position is in a central position and they are receiving the ball with back to goal, but if the ball is played to a wide player facing goal, the defenders will hold off – allowing the space for inside diagonal dribbling. Unfortunately for Southampton, the movements of Davis from a central attacking midfield position – into the left half space – cut off the possibility for Mane to receive the ball and dribble diagonally in-front of the Everton defence more frequently, as Barry would follow Davis into the space.